For some reason 2014 has bit me with a quilting bug like never before. Although I learned to quilt about ten years ago now, I have mostly confined myself to small projects (I’ve made 3 queen-size and 3 lap-sized quilts otherwise it’s all table runners and placemats) – mostly because I hate the actual quilting stage on a small sewing machine (and no, I don’t have room in my life for a long-arm). 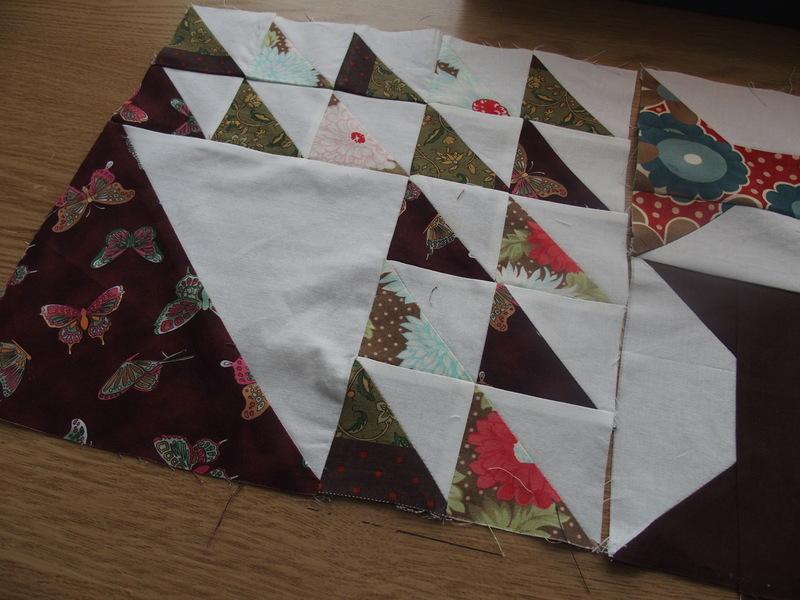 Samplers – I am fascinated with samplers and have long wanted to make one. In particular I would like to spring for the Mill Book 1852 Fat Quarter Bundle and use it as the basis of a Dear Jane quilt ….. but not before I get my act together and tackle a couple of simpler projects first. Piecing – Related to wanting to make a sampler quilt I have to acknowledge that I am an imprecise sewist and my piecing leaves a lot to be desired – so before tackling anything too huge I have decided to perfect my piecing skills bit by bit – while putting together two different quilts over the next year. 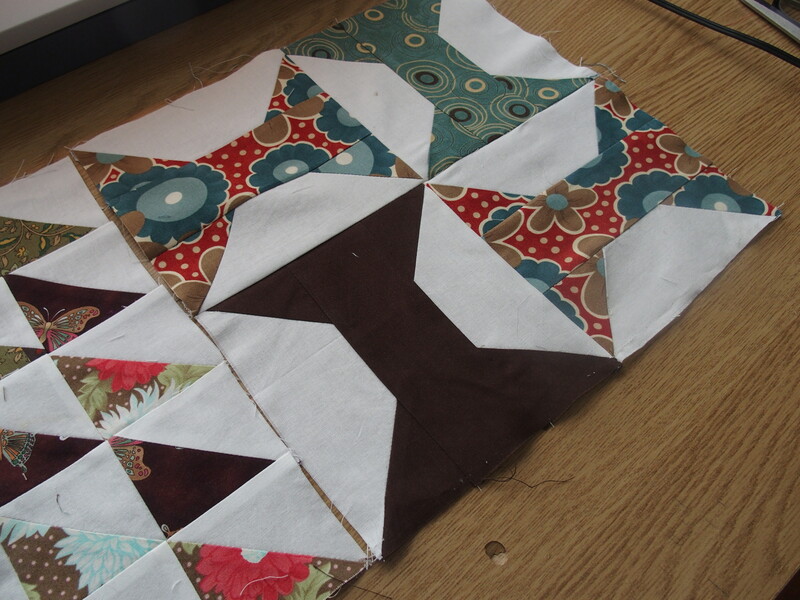 What you see below are the first two blocks for my first sampler project – which is a Block-A-Month hosted by Aurifil. I had a box of brown, turquoise and red fabrics (some already cut) set aside for a quilt that I never really started a couple of years ago – and decided to start there rather than purchase more. The top block is January, and the bottom February. I have not used my piecing foot in a very long time and lined my seams up entirely wrong on my first go at January – what you see below is the second attempt. Even though I almost had it right, both January and February fall a bit short of 12-inch finished blocks — but I hope to stretch the hell out of them when it comes to setting them into a quilt. Fortunately I have now figured out this piecing foot, though it is so hard to see the quarter-inch plate edge that I need my glasses to use it! (Confession – I need my glasses for pretty much anything close-up these days). ← Me and the new market totes.